BROOKINGS, S.D. - During the 81st annual convention of the South Dakota Sheep Growers Association (SDSGA) held September 28-29 in Brookings, two award-winning sheep operations were recognized with the South Dakota Master Lamb Producer award. This 35-year-old honor, was bestowed upon Tom and Marilyn Schwebach of Egan and the Erk Ranch of Newell. "These two operations are outstanding examples, showcasing the quality of the South Dakota sheep industry," said Jeff Held, Professor & SDSU Extension Sheep Specialist. "And, what makes it even better, is that they have the next generation involved to move forward into the future." Tom and Marilyn Schwebach run an 850-head commercial flock of Ile de France ewes which have highly productive maternal lines producing outstanding finished lambs for the packer and reputation replacement females for the industry. Unique flock management features include: a flock health plan of OPP-free (ovine progressive pneumonia) status for the past 20 years and a grazing management plan implemented 15 years ago, in cooperation with the South Dakota Grasslands Council, resulting in a 50 percent increase in grazing capacity. For more than 100 years, the Erk Ranch has produced feeder lambs and high quality wool in Butte County. Currently the operation runs more than 1,000 Rambouillet ewes including 300 registered animals. Range rams offered from the Erk Ranch to the industry have a strong reputation for superior wool traits, both fine fiber diameter and long staple length. For decades they have worked to improve economically important wool traits by selecting studs based objective measures of wool quality. Future flock genetic advancements in wool quality traits will be aided by wool Expected Breeding Value (EBV) values generated from the National Sheep Improvement Program and individual ewe performance data collected using the Shearwell Data System. The South Dakota Sheep Gowers Association also recognized other supporters of the industry. Brent Vander Ley, Chamberlain, received the Trapper of the Year award. "Brent has been with South Dakota Game, Fish and Parks for over 20 years and works tirelessly on the sheep producers behalf," said Steve Clements, director for South Dakota Sheep Growers Association, and serves as chair of the American Sheep Industry Predator Management Committee. Todd Nordmann and Steve DeGroot of Sioux Falls Regional Livestock, Worthing, with the Shepherd's Award. "The competitive bidding for all classes of sheep at Sioux Falls Regional Livestock sets the pace for "price discovery" for this region and is considered a key national market index for both feeder and finished lamb sold," Held said. More than a decade ago Sioux Falls Regional Livestock facility was built primarily to serve cattle producers, yet a weekly sheep and goats sale was also held. By 2009, demand for a strong sheep and goat market rose sharply when the Stockyards in Sioux Falls closed. The ownership group for Sioux Falls Regional Livestock asked Steve DeGroot, Orange City, Iowa and Todd Nordmann, Chancellor to establish a weekly sheep and goat auction. Working together for more than 20 years in a commission firm capacity at the Sioux Falls Stockyards, the men earned a reputation with producers of providing marketing excellence in the sheep and goat alleys. With their expertise and leadership, the number of sheep and goats sold has increased more than 50 percent with continued growth expected into the future. In 2017, sales topped 68,000 head. Elections were also held during the convention. 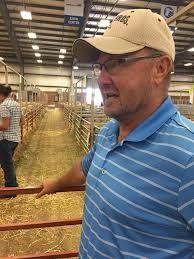 Sheep producer, Wade Kopren, Bison was elected to serve as president, as Rufus DeZeeuw, Elkton, completed his two-year term serving as president. Three producers were elected to serve on the board of directors: Kris Schweigert, Gregory; Lisa Dennert, Frederick and Scott Kilber, Ipswich. These directors will serve four-year terms, filling vacated director seats left open by Steve Clements, Tom Dosch and Tim Flint. In addition to elections, several in-depth workshops were held. Led by experts in the field, the workshops were designed to help sheep producers with: marketing and selection utilizing ultrasound technology; learn more about lamb cuts and processing; and ultimately improve their bottom line. Educational presentations were also held, covering a variety of topics including: grazing management and cover crops; predator management resources; Natural Resources Conservation Service Rainfall Simulator; lambing time management and wool quality improvement. Presentations were also provided by Jeff Held, Professor & SDSU Extension Sheep Specialist and Dave Ollila, SDSU Extension Sheep Field Specialist. The SDSU Extension staff reviewed current research and SDSU Extension programming. SDSGA and SDSU Extension have a long-standing partnership supporting the South Dakota sheep industry. Chris Diaz, USDA-Agriculture Marketing Service, reviewed lamb and wool prices. South Dakota fine wools saw record prices in 2018. Diaz shared that based on market indications, growers should look for this trend to hold for the upcoming 2019 shearing season. Regionally, average wool prices were around $3 greasy. This is a dollar above last year's prices. Peter Orwick, the American Sheep Industry, Executive Director, covered current issues and sheep industry updates. Jim Percival, American Lamb Board President, reviewed priorities for lamb promotions. Steve DeGroot, Sioux Falls Regional Livestock and Mike Caskey, Pine Lawn Farms discussed marketing trends in the lamb industry. Miss South Dakota, Carrie Wintel, made a special appearance during the convention's Lamb Lover's Social, where a wide variety of lamb appetizers were featured. The Lamb Lover's Social is a family-friendly social which featured a lamb BBQ Bootcamp, trade show booths, a fun speed shearing contest. The State Finals of the Make it With Wool contest was held September 29 in conjunction with an evening social, live and silent auction (proceeds used for education & promotion activities) and SDSGA awards banquet. Junior: Cortney Olinger, Plankinton. Olinger will advance to the National Make It With Wool contest held in New Orleans. Senior: Susan Roth. Roth cannot attend the national competition so alternate, Allison Duerre, Bristol, will compete in New Orleans. Adult: Anna Erk, Newell will compete in New Orleans. Professional: Koreen Anderson, Lemmon. Anderson will represent South Dakota in the National MIWW. She will submit her garment and a video of her modeling. Made for others: Denise Muntefering, Dimock. Muntefering sewed outfits for her three grandchildren. Wearable Accessory: Haile Stuck, Brentford. Stuck spun the yarn from her own sheep and made a finger knitted scarf. To learn more about South Dakota Sheep Growers Associations contact Lisa Surber, Executive Secretary SDSGA at [email protected] or go to www.sdsheepgrowers.org. And, for more information about upcoming SDSU Extension sheep activities, contact Held at [email protected] or (605) 688-5433 or Dave Ollila, SDSU Extension Sheep Field Specialist at [email protected] or 605-394-1722.